surely the most traditional and most popular of all the events in the Sant’Ambrogio week is the Oh Bej! Oh Bej! Christmas market which, for five centuries, has rung in the Milanese festive season with candies, surprises and of all kinds of gifts. Organized in honour of the city's patron, Sant’Ambrogio, it is celebrated on December 7th and lasts an average for four days. It is a must-see for both Milanese and tourists. You can search for the perfect gift or just to enjoy the magical atmosphere of celebration and tradition in the most important weekend leading up to Christmas. Traditionally organized in the streets around the Basilica of Sant'Ambrogio, in recent years the market has moved to the Castello Sforzesco, almost like an embrace around one of the city landmarks; this gives give more space to traders and to the large number of visitors who flock to the stalls every day. You can find products of all kinds and for all budgets: the stall holders vary from bric a brac sellers to florists, artisans, tradesmen with prints and books, masters of wrought iron, copper and brass, plus, crafted toys, sweet vendors, local honey producers, roasted chestnuts and “Firunatt” or “Firòn”, the traditional strings of smoked chestnuts that form long ‘necklaces’ … the choice is endless. Stroll around the stalls with a piping hot drink and enjoy the traditional Christmas treats (don’t forget that it’s now ‘Panettone season’ for all ages! ); it’s a winter experience not to be missed and the perfect way to get know and love the city just like the Milanese! The entire city dresses up to celebrate the favourite day of the year: lots of streets in Milan will be illuminated for the wonderful event: 35 km and 180 streets of twinkling Christmas lights will decorate the city from the centre to the outskirts. Arco della Pace area and the entire pedestrian island of Corso Sempione will be lit up in a beautiful shade of blue illuminating the pavements and trees with a design inspired by the charming Champs Elyseés; from piazza Loreto to the Porta Venezia gates, Corso Buenos Aires will transform into one long mile of pretty lights and shimmering golden balls; via Dante and via Mercanti will be decorated with luminous spheres and sparkling fringes; Corso Como doesn’t want to miss out on the party so it will get all dressed up with colourful art deco-inspired installations; Corso Vercelli (and the neighbouring streets) will glimmer in white with decorative balls and light games. 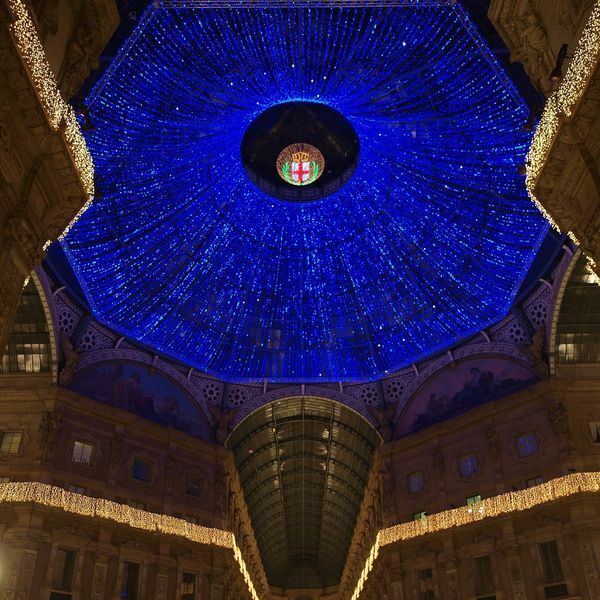 The switch-on in Galleria Vittorio Emanuele on Monday, December 4th is something not to be missed! The ceiling vault will shimmer and shine with 50,000 scintillating blue LEDs positioned 45 meters high, covering the dome’s lofty 800 m2, the awesome vault will complement the stunning Swarovsky tree that has now become a traditional sight positioned in the Octagon of the Galleria, Milan’s drawing room. At the same time, Corso Vittorio Emanuele will light up once again with stylish chandeliers inspired by delicious sweets and sugar sticks designs in a magical and colourful atmosphere. The atmosphere of the Fashion Quadrilateral is simply magical and, in via Montenapoleone, music will be the backdrop to events and shows, along with a sparkling magical Christmas tree in piazza Croce Rossa; via della Spiga will boast elegant green pine arches adorned with Christmas decorations. Other decorative trees are also positioned in different places around the city. First and foremost the glittering tree in the Octagon of the Galleria Vittorio Emanuele II which is an awesome sight for those walking underneath the festively illuminated dome; the silhouette of this festooned tree can also be glimpsed from piazza Duomo, set against the backdrop of the Milanese ‘living room’ And there's lots more to be enjoyed: the Christmas tree in piazza della Scala sponsored by Bulgari e the tree in front of the Central Station in piazza Duca d'Aosta sponsored by A2A. From December 6th to January 14th Palazzo Marino welcomes a masterpiece: the Sacred Conversation 1520 (Pala Gozzi) by Titian. Admission free. Once again this year you can get your skates on to glide on ice and celebrate Christmas in style and as there will be plenty of skating tracks set up around the city. Come along for great frosty fun in piazza Gae Aulenti where the rink is set against the splendid setting of the impressive new Milan skyline, from 10th November to 25th February, or in Largo Beltrami with the imposing Castello Sforzesco in the background, and at the Bagni Misteriosi from December 7th onwards. The Villaggio delle Meraviglie - Winter Wonderland, held in the Giardini Montanelli, will also make a return this year from December 2nd to January 7th; this space mainly dedicated to children with lots of super-fun initiatives designed for them including, of course, Santa Claus’ grotto! From November 11th to February 25th Piazza Gae Aulenti Time to get your skates on everyone…‘Gae Aulenti On Ice’ will be back again this year to offer great fun and entertainment for all ages under the shadows of the lofty UniCredit Tower and the Bosco Verticale residential block. From December 1st to January 7th, the excitement will rev up with the Christmas Village… handicraft stalls, artisan made gift ideas, delicious food products, children's workshops, street artists, a puppet theatre, fairground rides and lots and lots of fun!